Gym Belair & Blackwood | Why is EFM The Best Gym Near Blackwood? Hi, and welcome to EFM Belair Health Club! My name is Michael Forrest and I’m the head Trainer. I’ll help you get fitter, healthier and in the best shape of your life. EFM Belair Health Club has been in partnership with St John’s Grammar School, Gloucester Ave Belair, for over 10 years. Our goal is to motivate and help you reach your fitness goals whatever they may be. We have a great friendly group of members who have made EFM Belair Health Club a part of their life and hopefully we can become part of yours too! As a valued EFM Belair Health Club member, you have a qualified Personalised Trainer on hand every session to provide encouragement and support and guidance through our daily programs to help you achieve your goals. Located within St John’s Grammar (senior campus), Gloucester Ave Belair, we provide a great alternative to a “standard gym’ for the school community and the general public. At EFM Belair Health Club we look forward to working with you to reach your goals. Register for our special offer on the right of screen or in the green box below! 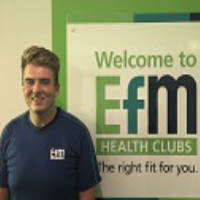 To tell you about me my names Michael Forrest, Im 26, I come from a strong EFM background, I’m a member of EFM Torrensville and had achieved another 1000+ visits at EFM Underdale and predominately EFM Flinders Park, where I lost almost 70kg in weight. I’ve also worked at several locations as a coach all around Adelaide. My aim as new coach is to build upon the already strong group culture I’ve walked into here at Belair, improve peoples techniques and get people to find that balance of hard work and good fun with their programs so they can enjoy their health and fitness journeys as I’ve been fortunate enough to be able to over the years.